From The Office of Hughes I.T. 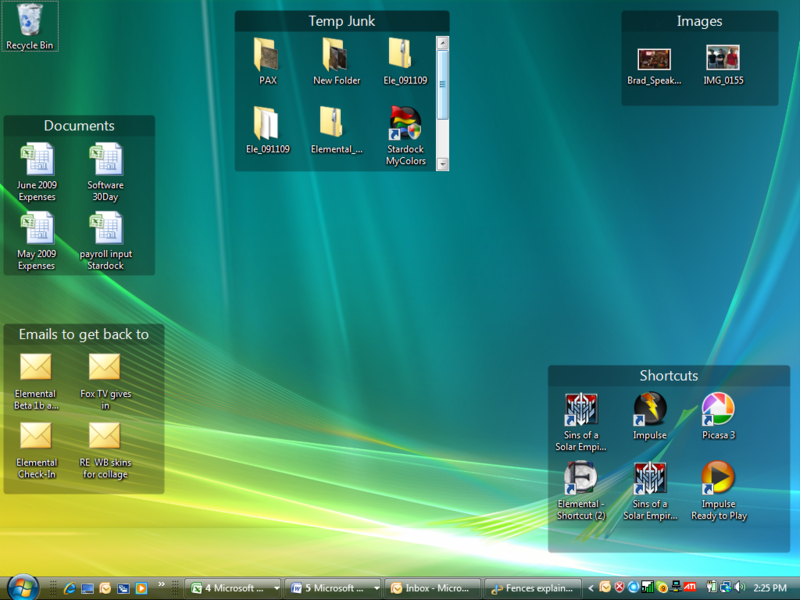 Solutions: Windows Desktop Clutter Solved, Thanks to Your Favorite Web Designer! Windows Desktop Clutter Solved, Thanks to Your Favorite Web Designer! Thanks for stopping back by. I have spent the better part of the last hour or so testing out a really amazing program for people like me. 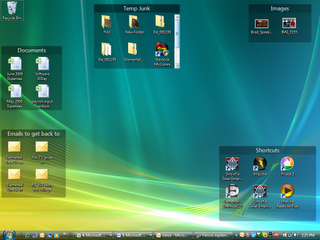 It took my cluttered up desktop and literaly transformed it into a managable and pleasant place to be. All my icons are nicely arranged into groups, and if I dont feel like staring at them, it's just a double click away. If you're losing the battle over your workspace to your desktop icons, a secret weapon is one click away. 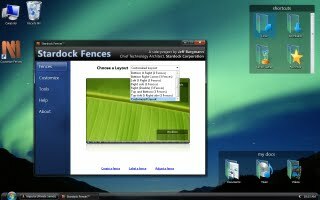 Fences quickly and easily organizes your icons into separate windows on your desktop, either automatically or manually. Labeling these boxes helps keep programs, photos, files, and Web links together, or you might choose to group by project rather than by file type. Whatever your logic, you'll be able to drag and drop fences (and the shortcuts within them) anywhere on your desktop. You can furthermore drag and drop shortcuts anywhere, and resize the fence. A scroll bar pops up so you can find your icons in fences that you've resized to be smaller than their contents. In addition to sorting shortcuts, you can cleverly hide them completely by double-tapping the desktop; double-tapping again resurfaces them. Fences helpfully lets you exclude select fences from hiding. Customization tools can change the color scheme or take snapshots of your layout at any time, in case you'd like to switch among them without completely redoing your arrangement. We just wish that creating a new fence was smoother and took fewer steps, and that you could create rules for certain files types to automatically download into specific fences. Perhaps we'll see that in a future premium version. In the meantime, we recommend Fences to anyone looking for a fast, fresh solution to persistent desktop clutter. And dont forget, if you need a great website, and you're anywhere in the world, just give us a call.